Easter is just around the corner! We’ve rounded up our five favourite Easter crafts to keep the kids entertained. Let’s hop to it! These adorable little bunnies are a great way to upcycle old socks (or buy new socks here if you don’t have any spare). They would look really cute as part of a festive table setting, or would even make great gifts. These puppets are super easy to make and fun to play with too. All you need is a wooden spoon, paint, glue, wiggle eyes and cardboard or craft foam. 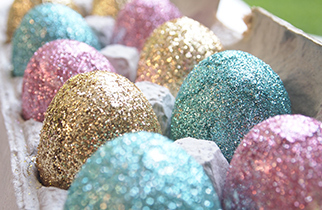 These sparkly eggs are a great alternative to the dyed or painted variety! Remember to do the glitter part outdoors though – there’s nothing more irritating that trying to get glitter out of a carpet or floorboards. Put old egg cartons to good use with this cute craft idea. Your kids will love playing dress-up with this sweet mask. All you need is cardboard, ribbon and child-friendly scissors, and you’re all set!